Giant panda isn't the only star article → Find more of them! The giant panda (scientific name : Ailuropoda melanoleuca, "black and white cat-foot"), is a bear with black and white fur. It lives in the mountain forests of central China. It eats mostly a kind of grass called bamboo. It is one of the most endangered species on Earth. The giant panda is about the size of an American black bear. They are two to three feet tall at the shoulder, while standing on all four legs. They are four to six feet long. Males weigh up to 250 lbs in the wild. Females rarely reach 220 lbs. They have black and white fur. The legs, shoulders, and ears are black. There are patches of black around the eyes. Giant pandas have five fingers and a "thumb" on their paws. This "thumb" is not a true thumb. It is a bony extension of the wrist. It helps the panda to hold the bamboo it eats. Giant pandas live in China. They once had widespread living areas in the lowlands, but human intrusion into these lowland areas forced the panda to move into the mountains of central China. These mountain areas are covered with deciduous and coniferous forests, and bamboo. The mountains are filled with thick clouds, heavy rains, and mists most of the year. Giant pandas eat a kind of fast-growing grass called bamboo. Their diet is almost 100% bamboo. Sometimes they eat other grasses and even small rodents like mice. In zoos, pandas have a more varied diet. They eat not only bamboo, but sugar cane, rice mush, a high-fiber biscuit, carrots, apples, and sweet potatoes. Giant pandas have a digestive system more like meat-eaters (carnivores) than plant-eaters (herbivores). Pandas must eat 20-40 pounds of bamboo per day to get all the nutrients they need. They pass 16-20 hours every day looking for food and eating. Female giant pandas can have their first babies when they are between the ages of four and eight. They can have babies until about the age of 20. The mating season is between March and May. The baby pandas are born in 95 to 160 days. A newborn cub is pink, blind, and toothless. He weighs only 90 to 130 grams (3.2 to 4.6 ounces), or about 1/800th of the mother's weight. The baby nurses from its mother's breast six to 14 times a day for up to 30 minutes at a time. The mother may leave the den to feed for three to four hours, which leaves the cub defenseless. One to two weeks after birth, the cub's skin turns gray where its hair will eventually become black. Male pandas live about 20 years. Females live a few years longer. The oldest panda in captivity was Ming Ming. She lived to be 34 years old. There are only a few giant pandas in zoos around the world. It is very difficult for pandas to breed in captivity. The Chinese have built special places in wild areas to shelter and care for pandas. Pandas were once hunted for their skins in China, but it is now against the law to hunt pandas. Currently, 14 cities outside of China have zoos that have giant pandas. The Adelaide Zoo in Adelaide, Australia received two giant pandas in 2009. The giant panda is the mascot of the World Wildlife Fund and appears here on a hot air balloon. The giant panda is one of the most endangered species on earth. It is endangered because its living areas and its stands of bamboo are being destroyed to make way for farms, housing, and other human developments. The giant panda is a symbol of China; it is also the symbol of the World Wildlife Fund (WWF). ↑ "China's Panda Diplomacy". Time. http://www.time.com/time/world/article/0,8599,1736273,00.html. Retrieved 2 May 2008. 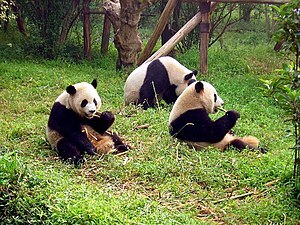 ↑ 2.0 2.1 2.2 2.3 2.4 "On this page you can find information about the giant pandas who live outside of China.". GiantPandaZoo. http://www.giantpandazoo.com/home.html. Retrieved 9 August 2010. ↑ "Zoologischer Garten Berlin". GiantPandaZoo. http://www.giantpandazoo.com/ZooBerlin.html. Retrieved 9 August 2010. ↑ Oleksyn, Veronika (23 August 2007). "Panda gives surprise birth in Austria". AP via Yahoo! News. http://news.yahoo.com/s/ap/20070823/ap_on_re_eu/austria_panda_birth;_ylt=AlL3xT8wyJr1.OzERBuxLYR0bBAF. Retrieved 24 August 2007. ↑ "Pandas sent off to Spain". http://www.lifeinthefastlane.ca/pandas-send-off-to-spain-from-chengdu-research-base/offbeat-news. Retrieved 5 May 2009. ↑ Casey, Michael (28 May 2009). "China experts say Thailand's panda cub healthy". Associated Press. http://www.msnbc.msn.com/id/30980596/. ↑ "Giant panda pair headed for Tokyo zoo". http://www.physorg.com/news199456657.html. Retrieved 2011-05-04. ↑ "Kobe Oji Zoo". GiantPandaZoo. http://www.giantpandazoo.com/KobeOjiZoo.html. Retrieved 9 August 2010. ↑ "Panda Zoos List". www.GiantPandaZoo.com. http://www.giantpandazoo.com/panda/panda-zoos. Retrieved 2011-05-05. ↑ "Rudd gives panda pledge". ABC. 11 April 2008. http://www.abc.net.au/news/stories/2008/04/11/2214650.htm?section=justin. Retrieved 3 May 2008. This page was last edited on 30 January 2016, at 04:55.